Leading Exporter of dill seeds, indian dill seed and pure & health dill seeds from Mumbai. In Norse, "dill" means "to lull". Dill tea is believed to cure insomnia. The seed is'light brown, winged and oval, with one side flat having two ridges. The other side is convex with three ridges and three oil channels. The leaves and stalks are aromatic and are used fresh or for pickling. Dill seeds has a somewhat sweet aroma but is slightly bitter in taste. The Dill seeds contain carvone as an essential oil. Dill is considered a carminative. It is an erect umbelliferous, hardy annual plant, growing to about 3 feet. The leaves are feathery and fernlike. Yellow flower bunches top the plant. Dill supplied by Grover is grown in sunny locations in deep and well-drained soils, mostly fertile and sandy loam, and fertilized using organic manure. The soil is kept slightly acidic to encourage better growth. Growing plants are watered regularly during the dry season. Unlike most other plants, dill needs protection from the wind. The top heavy hollow stalks, heavy with seeds can be easily knocked over by strong winds. Farmers ensure sufficient protection for the plants, without blocking the sunlight. Dill seeds are collected when they have completely ripened on the stem and have turned brown. The harvested seeds are spread out on a mat and sun dried before storage. The duration of exposure to sun is carefully monitored as this affects the flavor. 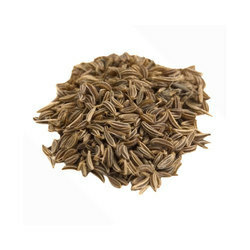 Dill seed has a pungent and aromatic flavour. The product shall be free from foreign odours and taste such as mustiness or rancidity. Acid insuluble ASH 1.50% Max. Dill SeedsIn Norse, "dill" means "to lull". Dill tea is believed to cure insomnia. The seed is'light brown, winged and oval, with one side flat having two ridges. The other side is convex with three ridges and three oil channels. The leaves and stalks are aromatic and are used fresh or for pickling. Whole dill seeds has a somewhat sweet aroma but is slightly bitter in taste. The seeds contain carvone as an essential oil. Dill is considered a carminative. It is an erect umbelliferous, hardy annual plant, growing to about 3 feet. The leaves are feathery and fernlike. Yellow flower bunches top the plant. whole dill seeds supplied by Grover is grown in sunny locations in deep and well-drained soils, mostly fertile and sandy loam, and fertilized using organic manure. The soil is kept slightly acidic to encourage better growth. Growing plants are watered regularly during the dry season. Unlike most other plants, dill needs protection from the wind. The top heavy hollow stalks, heavy with seeds can be easily knocked over by strong winds. Farmers ensure sufficient protection for the plants, without blocking the sunlight. 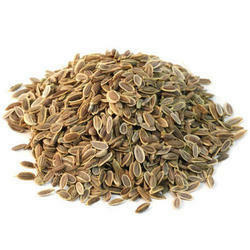 Dill seeds are collected when they have completely ripened on the stem and have turned brown. The harvested seeds are spread out on a mat and sun dried before storage. The duration of exposure to sun is carefully monitored as this affects the flavor. Dill Seeds In Norse, "dill" means "to lull". Dill tea is believed to cure insomnia. The seed is'light brown, winged and oval, with one side flat having two ridges. The other side is convex with three ridges and three oil channels. The leaves and stalks are aromatic and are used fresh or for pickling. Whole dill seeds has a somewhat sweet aroma but is slightly bitter in taste. The seeds contain carvone as an essential oil. Dill is considered a carminative. It is an erect umbelliferous, hardy annual plant, growing to about 3 feet. The leaves are feathery and fernlike. Yellow flower bunches top the plant.